On July 29, 1967 the aircraft carrier USS Forrestal was steaming off the coast of Vietnam where she was carrying out her mission making bombing runs in support of the US Military. This day would go down in history as one of the most savage fires at sea. 134 crew members were killed fighting the inferno. Some believe that the fire was set off when future Presidential candidate John McCain decided to "wet start" his jet to startle the pilot in the F-4 Phantom jet behind his Skyhawk. The "wet start" by McCain was verified during the investigation of the fire, although it is not stated in the training film. As a matter of fact, he was transferred off the Forrestal to the Oriskany while the dead were still being counted. He was the only crewman transferred as a a result of the fire, not counting some of the injured. As the son of Admiral McCain, his reputation had to be protected. His safety was undoubtedly a concern as well. A wet start is done by manually engaging the motor switch which allows kerosene to pool in the engine. This produces a large flame from the tail of the jet. In this case the flame "cooked off" the M34 Zuni rocket from the F-4 which then launched and hit McCain's jet. It also sent one of McCain's M-65 1,000 pound bombs crashing to the deck from a mount that was rated for only 500 pounds, resulting in it's explosion. 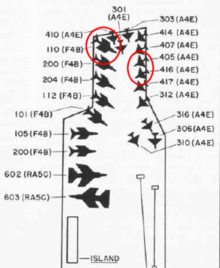 There are other versions concerning the start of the fire, and indeed this diagram shows Senator McCain's jet was on the opposite side of the deck facing inward, with only the South China Sea at it's back. This considerably alters the story. My own belief has always been that the pace of 4 days non-stop bombing runs produced "short cuts" in standard procedures designed to avoid such mishaps. A prime example is the 1,000 pound bombs being loaded onto 500 pound limit brackets affixed to the wings. Coupled with a shortage of "bomb jacks" to load the bombs, this was a recipe ripe for disaster. The fact that the crew were refueling while arming the jets was also a violation of procedure which only added to the deadly consequences. This is the link to the actual training film, which runs about 18 minutes. It was produced in 1973 and made part of the fire fighting training class. Mistake upon mistake added to the inferno. With the first fire fighting parties killed so quickly, the crew made up fire parties consisting of men untrained, or inexperienced, in using the equipment. For instance, after blanketing the fuel with foam another crew came in with hoses, washing the foam away and igniting a reflash. There were heroes that day. 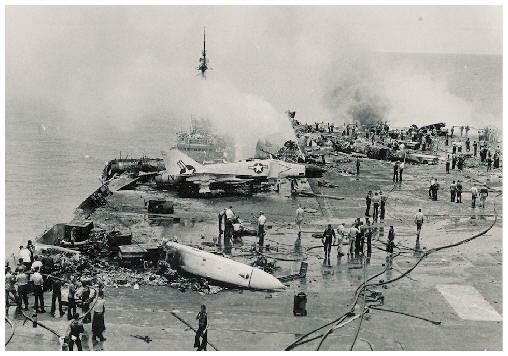 One Chief Petty Officer can be seen running across the deck, armed with only a fire extinquisher, in a vain effort to beat the "cookoff time" of the bomb. He can be seen disappearing in the explosion. There were, undoubtedly, many more unsung heroes that day. At sea there are no fire departments to call. If the ship is to survive the crew must put the blaze out. And it must be done quickly. My first experience with fire aboard ship came one afternoon on the USS Neosho, in the after steering compartment, which sits right above the rudder. The lube oil that cools the props had somehow leaked and a fire started. As I entered the space as the #2 man on the hose, I was very grateful for all of the training we had received in boot camp. Surrounded by flames can be a very disorienting experience. Training is the key to winning in any situation. This is even more so with a ship afire.